Regular reader Bernie who now resides along way from Hoylake in Ontario, Canada has sent me some great information relating to the Jesse Bird discussions that we’ve been having. 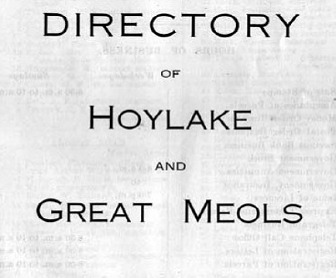 Well, there were certainly a few Hoylake residents named Bird around back in 1923! Jesse Bird was listed as 80a Market Street. 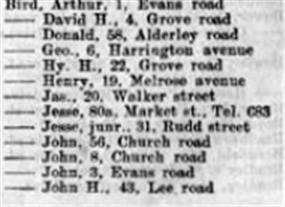 Do you see the entries for Church Road – was there a Church Road in Hoylake many years ago or do you think that relates to the one in West Kirby? I don’t remember Church Road in Hoylake, we had Chapel Road and Trinity Road, so I am agreeing with your guess that Church Road in West Kirby is the one. Hoylake was one of the last manual telephone exchanges in the UK you just lifted the phone and asked for the number, I think the YMCA was 330, but would guess you could ask for it by name. The switchboards were on the first floor of the building behind the Town Hall, overlooking Hoylake Station. The Automatic equipment, when installled went into the “modern” Building next to the Cottage hospital. We might have gone automatic a lot earlier were it not for the Second World War. I am sure someone in the Army saw stuff sign written for Hoylake being installed eleswhere in the world! the the trees in Newton on Cross lane. The site is now the council allotments. The sisters owned a 1939? Standard 9 car that that we used to service at the garage at the end of Cross lane Mount Motors. When the “misses” gave up driving the car was purchased by Mr E Jeffs. Hoylake’s Church Road is now Trinity Road, not sure why it was changed. Maybe because there was confusion with the one in WK! This was situated in the curve at the Prom end of Church Road. My apologies if this question has been previously answered, but I’m still trying to catch up. Thank you, Ricky. Very interesting, I didn’t know that! Mr. Swainson subsequently gave land for a continuation of Church Road through his property on to the shore, terminating at Mr. Hesselgraves’ and Mr.King’s school. In 1824 Mr. Swainson died, leaving Betty Swainson, his widow. This good lady, in 1833, gave the land for the Church, Vicarage and Schools, to the then Lord Bishop, and certain other clergymen as trustees. 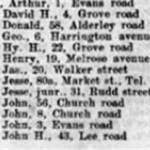 I could not find Trinity Road on the Census of 1891, but did find Church Road? 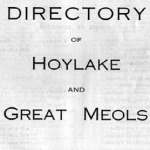 In your blog the paper article refures to “the free church” at Hoylake. Does this refure to the Holy Trinity Church on Church Rd or to the Fishermans Bethal at the bottom of Trinity road? You see I live in one of the ajoyning fishermans cottages conected to the fishermans Bethal. The Bethal and the three cottages were built together.